On Jan. 11, CV2 Magazine (Contemporary Verse 2: The Canadian Journal of Poetry and Critical Writing) celebrated Winnipeg poets and visual artists by launching “No Place Like Home: A Winnipeg Issue.” Published out of Winnipeg, the magazine combines poetry with a variety of interviews and essays in an attempt to increase the appreciation of contemporary poetry. “We want to spark conversations that get people interested in poetry, reading, writing, and understanding how it influences us artistically beyond just a traditional sense of what the genre is and what it does,” says Clarise Foster, editor of CV2 Magazine. CV2 remains the only poetry magazine that is published nationally as well as quarterly. Canadian poets and artists are featured with an emphasis on modern poetry as well as discussions and reviews of Canadian poetry. In the past, the magazine has featured artists from a specific province but this will be the first to feature those from a single city. 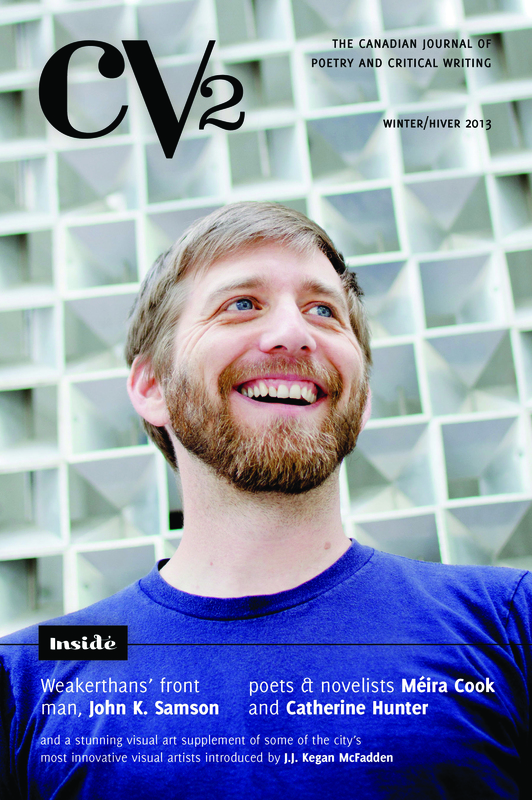 The current issue highlights an interview with Winnipeg musician John K. Samson (the Weakerthans) taken from the Winnipeg Poet Project. Recently Samson has worked as a Writer-in-Residence at the University of British Columbia with his wife Christine Fellows. He has also composed work for Camerata Nova, a Winnipeg-based choir, which made its debut in May of last year. “[The Winnipeg Poet Project is] a series of videotaped interviews with Winnipeg poets about their creative practice, their writing experience, and how the city of Winnipeg has shaped their work,” says Foster. It will soon be available online through CV2’s website. Meira Cook is another artist whose interview can be found in CV2’s current issue. Born in Johannesburg, South Africa, Cook immigrated to Winnipeg in the early 90s. She spent time living in Winnipeg where she received her PhD right here at the University of Manitoba. Cook has published numerous poetry collections, her most recent being A Walker in the City. Not only is she an accomplished poet, her novels The Blood Girls and The House on Sugarbush Road can be found in the fiction section. Cook has remained involved with the University of Manitoba since receiving her PhD. She has taught creative writing classes and has also participated in the Centre for Creative Writing and Oral Culture’s Writer-in-Residence Program in 2011. Cook holds literary awards to her name, including being first place in the CBC’s Literary Awards of 2007 and the Walrus Poetry Prize in 2012. Also featured in “No Place Like Home: A Winnipeg Issue” is Catherine Hunter, a novelist and poet. Hunter is currently a professor of English and creative writing at the University of Winnipeg, where she received her Masters degree. Her book Latent Heat, a collection of poetry, won the McNally Robinson Book of the Year Award in 1997. Not only is Hunter an accomplished poet, but she has also published four adult fiction novels. Her most recent work, Queen of Diamonds, is a murder mystery novel that takes place in Winnipeg. The novel is set in Wolseley and involves a con artist and his wealthy clientele. “One of the things CV2 does more often than most other Canadian literary magazines is publish new voices, and it is especially gratifying to be able to offer the opportunity to our readers to experience the work of [an] emerging Winnipeg poet,” says Foster. Foster believes that it is important to examine where poetry comes from in order to appreciate the art. CV2 Magazine hopes to examine other cities in depth in the future.